EVER since the Monte Carlo Rally came into being in 1911 it has steadily grown in favour. In those days, adventurous as it was to journey so far as Monte Carlo, the distance required in order to have a chance of success was not so great, Paris or Berlin being suitable starting points. With the greater reliability of modern cars, however, a premium has been placed on mileage, and in the last few years the Arctic Circle has been carefully combed with a view to finding a starting place giving the greatest possible mileage to Monte Carlo. This necessity of covering a long distance in a certain time in itself accounts to a large measure for the Rally's continued popularity among sporting motorists, and this year competition should prove keener than ever. As last year, the longest itinerary will be that from Athens, with a distance of 3.786 km. although Tallin, in Finland, is only 6 kilos. shorter. Other far-distant points are Bucharest (3,772 km. ), Umea (3,736 km.) and Stavanger (3,652 km.). In 1931 Donald Healey (Invicta) was the winner, starting from Stavanger, while last January Vasselle (Hotchkiss) made Umea his starting point. Although Athens is the greatest distance from Monte Carlo, the route presents almost insuperable difficulties in the way of appalling road conditions in Salonika, but it is a sure indication of the way in which events of this nature assist car development that this route has recently been conquered. 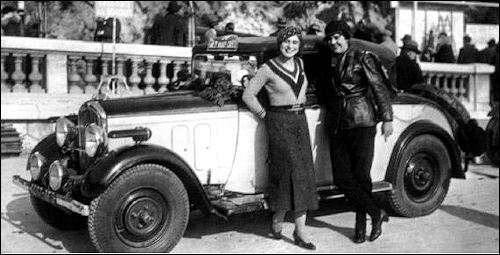 In 1931 no one got through from the Greek capital in time, the best effort being that of Jacques Bignan on a Fiat. In the following year, however, several competitors succeeded, notably Rupert Riley on an "Overseas" Riley, and Andre Boillot on a Peugeot. For the forthcoming Rally the only British entrant who has so far stated his intention of starting from Athens is Rupert Riley, again at the wheel of an "Overseas" Riley. His experience last year should prove invaluable, and everyone will wish him the best of luck. 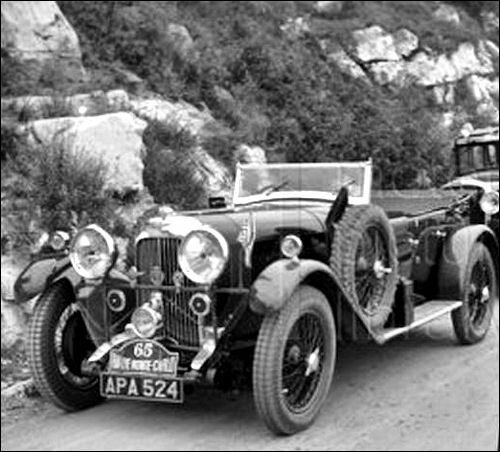 As is only to be expected from a firm who make a determined effort to perform successfully in long distance reliability trials, the Riley people are really more advanced with their plans than any other English entrants, seven cars having already been nominated, three being the official team and the rest consisting of private individuals. The official team is Rupert Riley, V. E. Leverett (who won the junior class in 1931) and G. F. Dennison. Leverett will drive a "Gamecock" two-seater from Bucharest, another English crew starting from this point being E. Prestwich and Tanner at the wheel of an M.G. Midget. There has been a rumour that the road from Bucharest to Jassa is often impassable in winter, the snow being very thick and effectively hindering cars for weeks at a time. The last member of the team, G. F. Dennison, will also pilot a "Gamecock," but will make Umea his zero point, while Mrs. Raymond Gough will be another starter from Umea in her Riley. Tallin, in Finland, will probably attract a considerable number of British entrants, but the only definite starters so far are Norman Black with an Essex "Terraplane," and Jack Hobbs, veteran of many trials, with his open 4-seater Riley. A "Speed Twenty" Alvis will probably start from Tallin, driven by C. S. Hollingshurst. Another Essex "Terraplane" starts from John o'Groats, driven by F. S. Couldrey, and as usual a good field will take this Scottish extremity as their "kicking off" point. Two Rileys have already been entered, namely, by Mrs. Montague Johnstone and Commander G. N. Maltby. The rules of the Rally, which is organised by the International Sporting Club of Monte Carlo in conjunction with the Automobile Club of Monaco, are of the normal type, involving controls, etc., and an average speed of 25 m.p.h. has to be maintained throughout. Although the cars are divided into two classes, over and under 1,500 c.c., the same average speed has to be maintained by both categories. The large cars must carry four passengers, and the 1,500 c.c. vehicles two, such passengers being "non transferable," and must stick out the whole journey without being relieved by reserves half way through. The much discussed Slow-Running Test at the finish, in order to ascertain the condition of the competing cars after their long journey, has been cancelled this year, and an Acceleration and Braking Test substituted in its stead. Cars will have to accelerate as fast as possible for 100 metres from a standing start, and then pull up in the shortest possible distance, no skidding sideways being allowed, for the cars have to keep between 2 lines, 4 metres apart. The Rally competitors are due to arrive at Monte Carlo on January 25th, the Acceleration and Braking Test taking place immediately on arrival. The following day is a day of rest. On Friday, the 27th, a competition for the most comfortable car is to be held on the Terraces of the Casino. On Saturday afternoon, from 2 to 5, the "Mont des Mules" Hill Climb takes place on the Beausoleil-La Turbie road, between the Riviera Palace and the Junction of the Grand Corniche Road. The length of the hill is three kilometres, with a gradient of approximately six per cent., and the climb is optional to Rally entrants, having no bearing on the results. Finally, on Sunday, 29th January, there is a Parade of Cars and Distribution of the Prizes at 2 p.m. and in the evening a dinner offered by the International Sporting Club in honour of the Competitors of the Rally and their passengers. 12 C.J.S. Montague-Johnstone Riley Gamecock John o'Groats acc. 21 A.C. Lace Invicta Tallinin ret. 42 Petre G. Cristea Dodge Athens ret. 60 Miss E.M. Riddell Alvis Tallinin ret. 80 F.S. Hutchens / Nancy Blackwell Wolseley Hornet Daytona Stavanger acc. 94 Morna Lloyd Vaughan / Elsie Mary Wisdom Standard Tallinin ret. 95 Thomas V.G. Selby Ford V8 Stavanger ret. 96 J.G. Smithson MG Stavanger ret. 108 L. Jaffe Wanderer Tallinin acc. 115 Donald M. Healey Invicta 4.5 L Tallinin ret. 123 Per W. Schencke / Bjarne Thorstensen Buick Stavanger acc. MAGNIFICENT VICTORY FOR HOTCHKISS DRIVER IN MONTE CARLO RALLY. RIGOROUS CONDITIONS FROM ALL STARTING CONTROLS. FOR the second year in succession M. Vasselle, the well known Hotchkiss driver, has won the Monte Carlo Rally. Starting from Tallinn, in Esthonia, the Frenchman had a trouble-free run, and his victory for France is consolidated by the fact that Mme. Rouault and M. Quinlin carried off the Riviera Cup for light cars in a Samson. Never have more difficult conditions been experienced by competitors from all starting points. The whole of Europe was in the grip of Arctic weather, there being heavy snow on all routes, while an icy road-surface was the general rule. 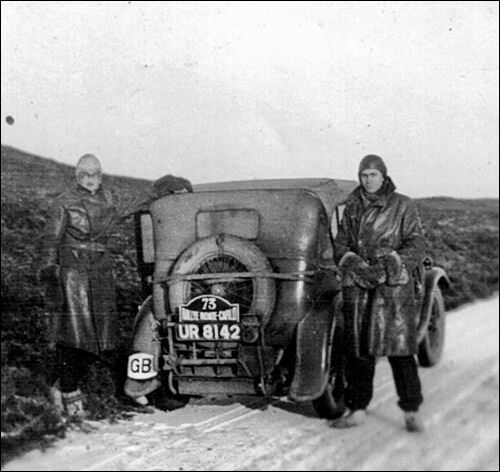 The first ten cars all came from Tallinn, the road from Athens being impassable and only two cars, Rupert Riley's Riley and Trevoux's Hotchkiss surviving the etape to Belgrade. Still more unfortunate were those starting from Bucharest, who found the first stage to Jassy completely blocked with 18 ft. of snow, and had to change their starting points to Jassy, Lwow and Warsaw. The chief difficulties against the Tallinn group were snow, ice and extreme cold, sometimes amounting to 35 degrees of frost. A. C. Lace and his crew in an open Invicta with small aero windscreens had to retire from frost-bite. Miss Riddell was last heard of with petrol-feed troubles on her Speed Twenty Alvis, while Huntley-Walker (Riley), Lace, J. Hobbs (Riley), and D. M. Healey (Invicta) were late at the Warsaw control. Healey came across Belgrave's Magna in the ditch and towed it out, the trouble being caused by a failure of lights owing to a battery lead coming adrift. Just before Warsaw, Healey was passing a sleigh, which pulled out and blocked the road. Healey took to the loose snow at the side of the road and skidded into a tree, damaging the Invicta's radiator beyond repair. Mrs. Vaughan crashed soon after the start, and was reported to have broken her arm. Another lady, Mlle. L. Jaffe overturned her Wanderer without serious injury. 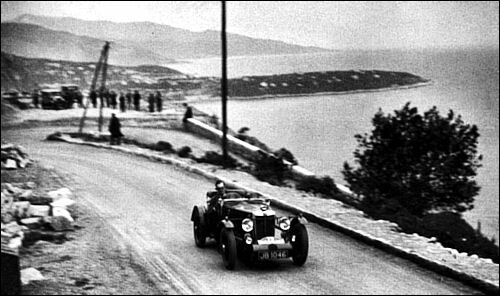 From Athens no competitors got through to the finish at all, while of those who were to have started from Bucharest only F. du Bremond (Mathis) and R. Stoclet (Lancia) arrived at Monte Carlo. Only three of the Umea group dropped out, and six from Stavanger, F. S. Hutchens crashing on his Wolseley Hornet. The most serious accident occurred to Schenke, whose Buick fell into a lake. Schenke got out of the car through a window, but had to dive in again to rescue his passenger. Naturally enough, the highest percentage of finishers came from John o'Groats, which is the easiest starting control. 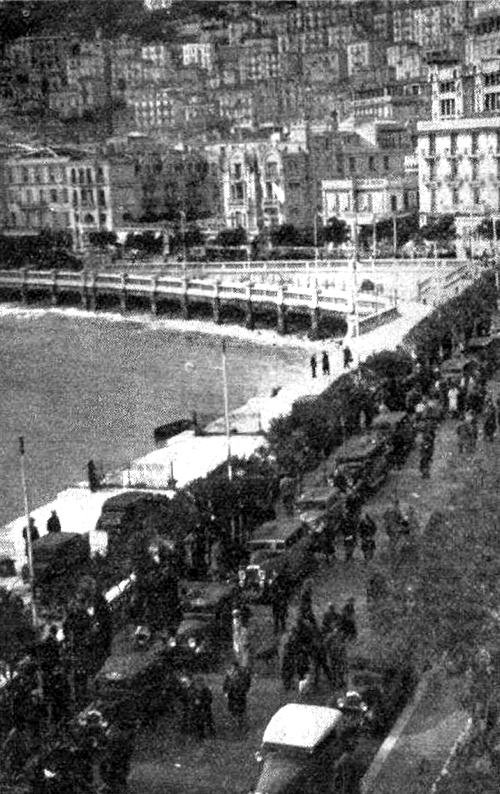 Bainbridge had a smash with his Rolls-Royce on the way up, but got to Monte Carlo eventually, and H. S. Linfield (Essex Terraplane) was late at several controls. 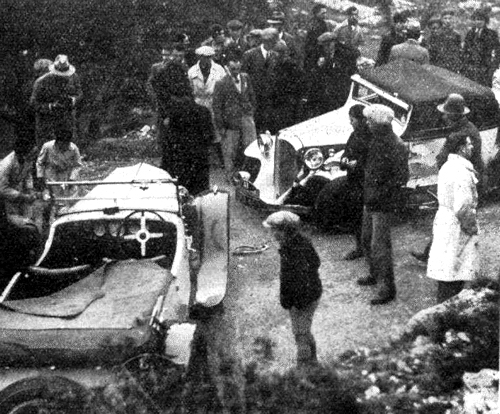 What might have been a catastrophe occurred in France when the Riley Gamecock driven by Mrs. Montague Johnstone overturned through skidding on an ice-bound road. By a miracle neither of the occupants was injured, and with remarkable courage proceeded to right their vehicle, and set off once more minus hood and windscreen. Despite great cold and discomfort, they succeeded in reaching Monte Carlo, which shows what stuff the true Rally driver is made of! The results are not encouraging from the British point of view, for of the first ten in the final list of awards there is not a single British production-car—for the Gardiner-Bentley is only an experimental model. France's victory is a complete one, for of the remaining nine cars, eight are French and one Italian. Vasselle and the Hotchkiss Company are to be congratulated on their success. To win two years running is no accident, and can only be the result of careful preparations and driving. The Renault's second place was well deserved, while the Salmson concern have re-entered the competition field in great style by winning the small car class and being placed third in the general classification. Mine. Schell's Talbot was a meticulously prepared car with a home-made fabric body weighing only 2 cwt. The Gardiner-Bentley, driven with his usual skill by Lord de Clifford, has scored a great triumph for the C.1. type by finishing fifth, and its prestige should be greatly enhanced. An outstandingly good show was put up by the little Fiat "Balila" driven by Prince Narischkine, which is a really cheap production and has shown its worth in no unconvincing manner. 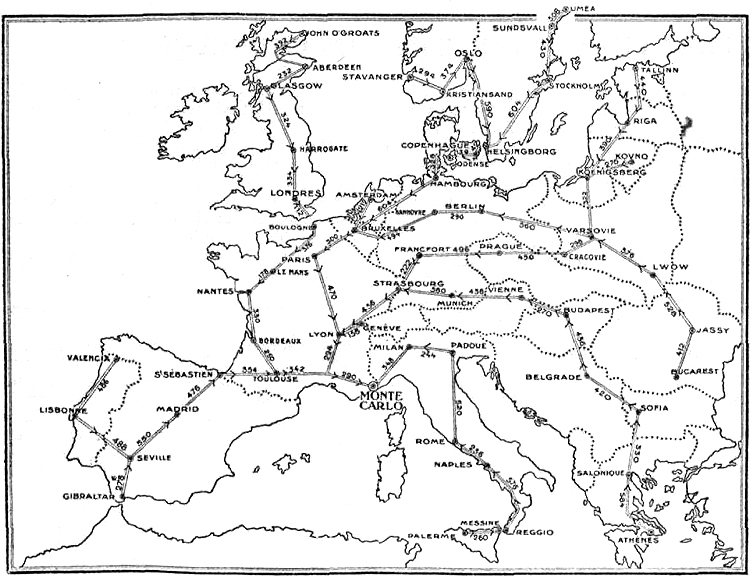 In negotiating the miles of 10 inch ruts between Tallinn and Riga light cars are at a distinct disadvantage when compared with the big fellows like Guyot's Renault and Vasselle's Hotchkiss, and the performance of small machines like the Salmson, Amilcar, Fiat and Peugeot is therefore all the more creditable. 1. M. Vasselle (Hotchkiss 3,485 c.c.). 2. R. Guyot (Renault 4,232 c.c.). 3. Mme. Rouault-M Quinlin (Salmson 1,495 c.c.). 4. Mme. L. Schell-L. Schell (Darracq 2,505 c.c.). 5. Lord de Clifford (Gardiner-Diesel-Bentley 5,570 c.c.). 6. R. Bravard (Amilcar 1,243 c.c.). 7. L. Braillard (Bugatti 3,257 c.c.). 8 Prince Narischkine (Fiat 995 c.c.). 9. H. Battu (Citroen 2,644 c.c.). 10. G. de Lavalette (Peugeot 1,465 c.c.). All the above started from Tallinn. The following also finished:— From Tallinn.—Baron de Montpellier (Chrysler), F. Pousse (Amilcar), Mme. M. Mareuse (Peugeot), H. Schreiber (Tatra), M. Laeroze (M.G.). From Bucharest (after re-start from Lwow.—F. du Bremond (Mathis), R. Stoclet (Lancia). From Umea.—C. de Cortanze (Peugeot), G. F. Dennison (Riley), Mrs. R. Gough (Riley), Mlle. Stackelberg (Hupmobile), Norman Black (Essex Terraplane), Comte van Heiden (Panhard). From Stavanger.—G. Larue (Peugeot), J. W. Whalley (Ford), K. Bryde, jun. (Studebaker), M. Bergan (Austin). From John o' Groats.—H. T. vnn Marken (Chrysler), Mrs. Montague Johnstone (Riley), P. E. Cremetti (Riley), Lt.-Cmdr. G. Maltby (Riley), P. Runciman (Alvis), F. Longman (Andre V.6), D. C. Love (Lagonda), J. S. Couldrey (Essex Terraplane), Mrs. L. Martin (Hillman), W. T. Townend (Talbot), H. C. Hobson (Austin), L. Martin (Humber), V. A. P. Bridge (Standard), W. Platt (M.G. ), R. H. W. Jaques (Rolls Royce), Col. A. H. Loughborough (Lanchester), J. B. Bainbridge (Rolls-Royce), T. C. Mann (Lagonda), J. V. Crisp (Alvis), F. M. Lightfoot (Morris), F. S. Barnes (Singer), G. W. J. H. Wright (M.G. ), H. J. Aldington (Frazer Nash), Miss S. P. Richardson (Ford), G. E. Stott (Daimler). T. denotes starting from Tallinn; U. from Umea; S. from Stavanger; R. from Riga; J.G. from John o'Groats. 69, P. Longman (V6), 498.00. With the exception of E. M. Liddell and J. B. Bainbridge, who started from Harrogate, all competitors started from John o'Groats. The International Sporting Club Cup.—MVasselle (Hotchkiss). Riviera Cup (premier award for cars under 1,500 c.c.).—Mme. Rouault (Salmson). "La Journal" Challenge Cup (for longest distance).—M. Vasselle (Hotchkiss). The Late Public Schools Motor Club Challenge Trophy.—Lord de Clifford (Gardner-Diesel-Bentley). The Ladies' Cup (for the woman competitor who, without a male passenger, attains the highest number of points).—1, Mme. IL Mareuse (Peugeot) ; 2, Mrs. Raymond Gough (Riley) ; 3, Mrs. L. Martin (Hillman). Endurance Trophy for Ladies (same conditions as for the Ladies' Cup).—Mme. Mareuse. Barclay's Bank Silver Challenge Cup (for best classification with an all-British car).—Lord de Clifford (Gardner-Diesel-Bentley). Royal Scottish Automobile Club Prize (for competitor obtaining highest number of points from a starting-point in Scotland).—L. Martin (Humber Snipe). The Thistle Cup (for competitor obtaining highest number of points from a starting-point in Great Britain).—L. Martin (Humber Snipe). "L'Illustration" Automobile Challenge Cup.—M. Vasselle (Hotchkiss), R. Guyot (Renault) and. Mine. Rouault (Salmson). Portugal Automobile Club Challenge Cup (for highest number of points starting from Portugal)—F. W. C. M. Staal (Bugatti). Norway Cup (best classification from Norwegian starting point).—R. Bryde, Junr. (Studebaker). "Aftenposten" Challenge Trophy (ditto, under 1,500 c.c.).—P. Bergan (Austin). Chesterfield Cup (for highest marks in acceleration and braking test).—M. Vasselle (Hotchkiss). ROUNDING OFF THE RALLY A COMPETITION, motoring or otherwise, which is not declared by someone to be unfair, is an almost unknown thing. The International Sporting Club, the Automobile Club of Monaco, and M. Anthony Noghes, the President of the A.C.M. on whom the heaviest part of the work of organisation falls, therefore deserve every congratulation on the success of the Monte Carlo Rally. This year, as everyone knows, the average speed of 25 m.p.h. had to be maintained between each check instead of over the whole distance, so that any car suffering from major troubles enough to cause it to fall as little as half an hour behind time at the controls loses all chance of winning. Furthermore, the marks awarded for the final tests were such that they only sufficed to determine the winner from amongst those from the furthest point from which cars arrived, which was of course in the present Rally, Tallinn, in Estonia. Lastly, the acceleration and braking tests on which the extra marks were based, gave a good indication of the condition of the cars after their strenuous runs across Europe. A popular success. The Rally was won of course by M. Vasselle on a Hotchkiss, who also received awards for the greatest distance covered and for being in the first three in three Rallies. His success was very popular amongst all the competitors. Guyot on the Renault was only 7 marks behind Vasselle, and Mme. Rouault on the Salmson who was third, also won the Coupe de la Riviera for the highest placed car up to 1,500 c.c. Mme. 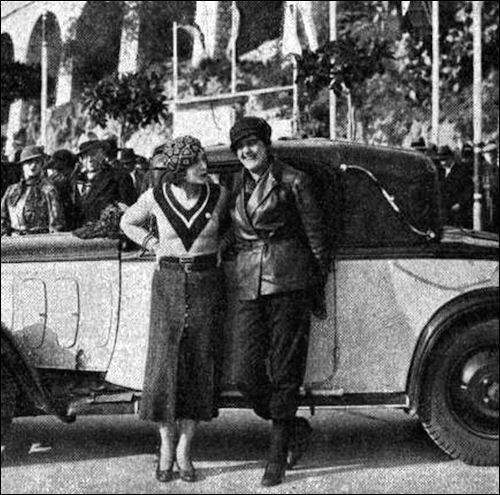 Schell on her Talbot is a very enthusiastic rally competitor and designed the body and equipment of the car herself. Britain's name does not figure until 5th place, Lord de Clifford on the Gardner Bentley. A fine performance this, for the chassis, which is seven years old was never intended to carry a five litre engine, and the whole outfit was assembled in the first place merely as an experiment. In spite of this, it was driven at high speed throughout and with more modern braking equipment might have improved its place in the final order. The Wonderful M.G. Magna. 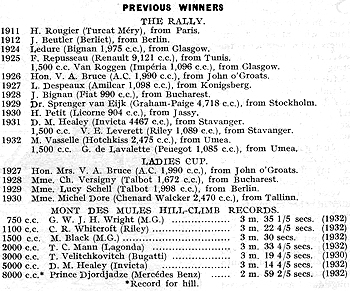 No other English car figures in the list of prize winners, but the performance of Lacroze and Belgrave on the M.G. Magna, who finished 14th, is certainly worthy of comment. These two enthusiasts took their perfectly standard machine, which the makers would be the first to admit, was not designed for negotiating colonial sections, negotiated some of the worst roads in Europe without experiencing any mechanical trouble. Like everyone else from Tallinn, they suffered considerable hardships from the intense cold, but in spite of that finished at Monte Carlo quite unperturbed by what they had gone through. Best performance from England was made by Lionel Martin, whose Humber Snipe came through in a comfortable and trouble-free run. It's no use worrying now, but if Healey hadn't hit that tree, or if Rupert Riley had managed the final stretch from Vienna—still, there's always next year. The Concours de Confort, which is not merely for the car which has the most hot water bottles and cocktail-shakers, was won by Townend on a "95" Talbot which was prepared by Pass and Joyce. Eight out of eleven awards went to British cars, which was a slight consolation after the rally results. The Hill-Climb too was quite encouraging, three class records being raised by British cars, the blown Magnette making its bow before the public by putting up fastest time. The marshalling system, with its flag-waving which failed to convey its message of a blocked road, is not worthy of the general level of organisation of the Monte Carlo week, and one hopes next year that a telephone system will be in operation. The life of a Rally competitor is not all motoring and the Committee arranged a tea-dance at which a large number of cabaret turns were seen, a performance of "The Barber of Seville" at the Opera and the final dinner at the Sporting Club. This year showery weather prevented the procession to the Palace at Monaco for the presentation of prizes, so they were given away instead at the dinner. A magnificent display of fireworks enlivened proceedings, and dancing and festivities went on till six o'clock on Monday morning so that by the time the revellers returned to their hotels, it was time to pack and set off for England. Thanks, Mr. Browning! In conclusion the thanks of all the British competitors must be given to Mr. H. B. Browning, secretary of the Monte Carlo Rally British Competitors Club. The arrangements he made enabled members of the Club to secure hotel accommodation at a much reduced rate, and his advice and help was of great service to those visiting Monte Carlo for the first time. A very successful dinner was held at the Riviera Palace Hotel on the Wednesday night, at which Mr. Anthony Noghes and Madame Noghes, General Polovtsoff, President of the Sporting Club, and Mr. M. L. Ainslie, British Vice Consul, and Mrs. Ainslie, were the guests. Amusing speeches were made by Lord de Clifford, President of the Club, Colonel Lindsay Lloyd, the R.A.C. delegate and the Secretary, and the guests made suitable replies. Some idea of the importance of the British entry is shown by the fact that 25% of the entrants of the Rally were British. The best of British cars: the experimental Benley-Gardner-Diesel. COLD AND ICE MAKE THE TWELFTH MONTE CARLO RALLY THE MOST STRENUOUS EVER HELD. THIS year, as on previous occasions Athens was the most distant, and therefore the most highly marked of the starting places for the Monte Carlo Rally. Fifteen starters presented themselves, but the going was too hard for nearly all of them. The last to give up was Rupert Riley, who had successfully negotiated the shocking roads and mountain passes of the Balkans, only to be held up by snow at Vienna. A very gallant effort this and one which with a little better fortune, would have brought the premier award to Great Britain. ... "it would have been necessary to average 45 m.p.h. over the snow- inpossible task." 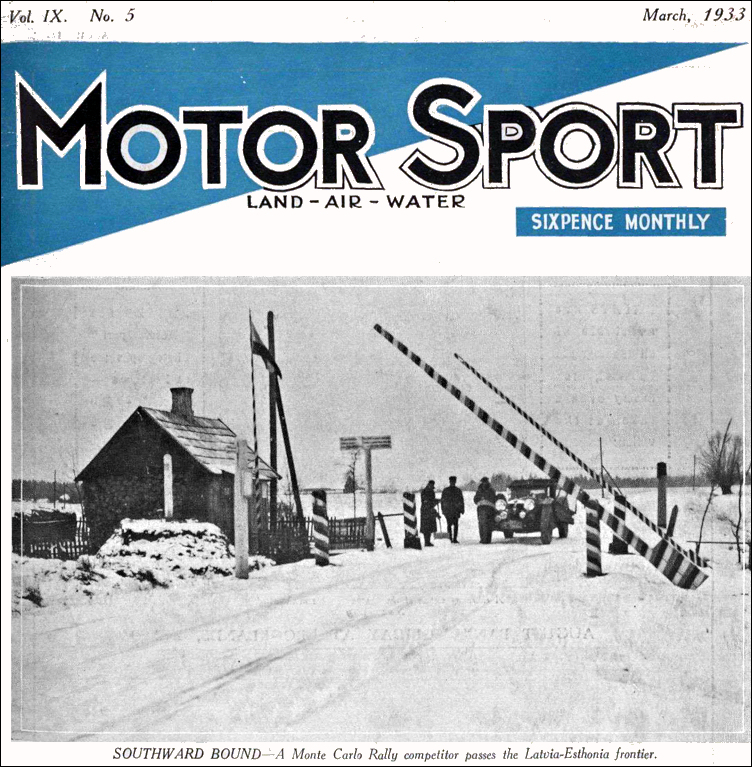 Tallinn was the next most distant starting place, and some account of the run from there to Riga was given in last month's issue of MOTOR SPORT. By Riga the British contingent had been weakened by the loss of Mrs. Vaughan, whose Standard was ditched near Parnu and Hobbs, whose club carnet had mysteriously disappeared. Lace had visited a ditch without much damage except the loss of the sump plug and all the oil. Healey, the first competitor to arrive, reached the control just after noon. The Latvian Automobile Club had made every preparation for the reception of the various crews, most welcome being an excellent lunch. After that everyone tried to get a little,sleep, waking up again at 4.30 to feed again at the Club's expense and to be grateful for the continental enthusiasm for sporting motorists which was encountered throughout the run. Most of the competitors had gone out from time to time to warm up their engines and did not have much difficulty in re-starting but the Diesel Bentley crew experienced considerable trouble, as the pinions on the starters had frozen to the threads. The first car left Riga at 5.30, the regulations this year providing that the cars should leave each check in numerical order. The metre of snow which one had been led to expect between Tallinn and Riga had not appeared but there was definite news of a heavy fall in Lithuania. With this in prospect, the Invicta once more did its stuff, and hummed on its way to the frontier which was 47 miles away. Schell and Vasselle who were maintaining a steadier average were soon overtaken. 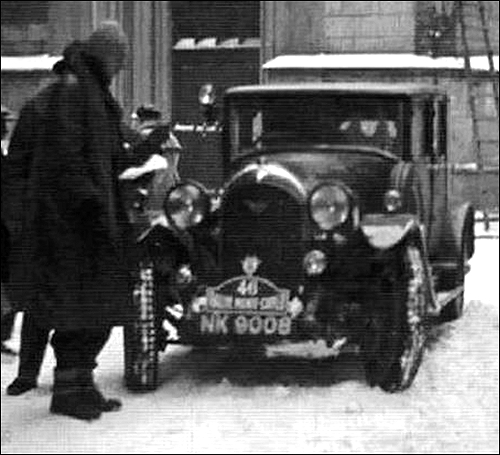 On one of the fast snow-covered stretches the Invicta had been coming up with a slower car, but while it was still far away the lights disappeared, so that it was apparently a local vehicle. In five minutes, however, a small car without lights was sighted, which proved to be the Magna driven by Lacroze and Belgrave. Their lights had failed and they had plunged into a snow drift at the side of the road. Luckily they had a wire rope on board and the Invicta soon had them back onto the harder surface. Their trouble was nothing worse than a loose battery lead, and they were soon under way again. Donald Healey's Invicta in Germany. Passing on snow-covered roads was very difficult, as the water-vapour in the exhaust gases condenses like the smoke from a heath-fire, and clouds of snow thrown up added to the denseness. At the side of the road there are drifts nearly two feet deep, with ruts underneath. At the Lithuanian frontier arrangements had been made for dealing promptly with the carnets, and Healey, who has had a great deal of experience at this kind of thing saved much time by keeping the essential papers under his hand, thus getting away before a number of competitors who had arrived before him. We were now faced with Lithuania, which had been rated as one of the chief danger points as regards depth of snow, but the authorities had taken a great deal of trouble to clear the roads. Gangs of men and snow ploughs were seen at work, and from the comparative warmth of the Invicta we thanked our stars that we were not at work on a Sunday night at a temperature of -10 or so, or even accompanying Lace who was driving the other Invicta, and disdained the use of weather protection other than aero-windscreens. There was enough snow left to form a comfortable carpet over the road, and the run to Tilsit was a great improvement over the first part of the journey. Supper,. consisting of 2 1/3 Oxo biscuits and some barley sugar, was served en route. Tilsit is the frontier station for East Prussia and the Invicta reached there at 11.15 p.m. After warming ourselves at the Lithuania post we drove across the bridge into German territory and there realised that we had picked up an hour owing to the difference in time. The East Prussian roads, which are tree-lined and for the most part dead straight, allowed a good speed to be maintained, and the exhaust heater did its stuff most pleasantly. By taking an alternate route supplied by the A.V.D. on the journey north through Berlin, no more passing had to be done and we arrived at Konigsberg at 12.20 a.m., averaging nearly 40 m.p.h. for the whole 390 km. from Riga. Once more there was time in hand, so the crew betook itself to bed for four hours. No.73 Jack V. Crisp drove his Alvis from John o'Groats and took 38th place. The Königsberg Motor Club had arranged "lunch," i.e., a hot meal, at 4 a.m., and with a feeling rather like the condemned man eating his last breakfast on earth, the "concurrents" did themselves full justice and set their teeth in anticipation of the snow-covered wildernesses of Poland. Most people had managed to carry on so far, but the Huntley Walkers did not seem at all cheerful and the Alvis was spluttering in an unhappy way. The usual overtaking tactics were pursued, and the excellent A.A. routes enabled Healey to pass through several places where foreigners not so well provided were circling round doubtful of the proper route to follow. Dawn broke about seven o'clock and with the growing light, sledges appeared on the road. Healey tried to overtake one of these vehicles, but prevented by the plunging horses from seeing an acute bend, he crashed into a tree at the side of the road and damaged his radiator so much that all the water was lost. 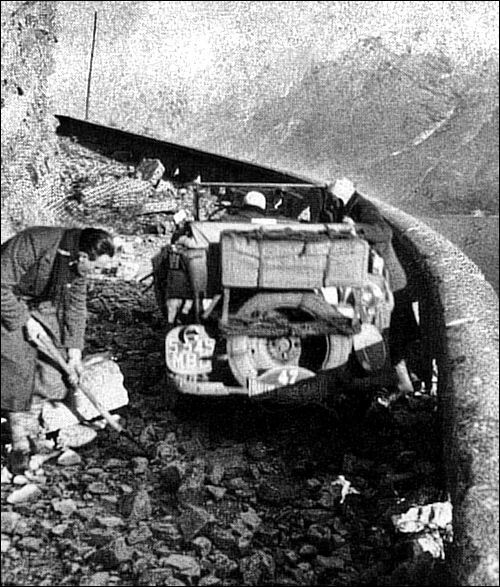 The car crawled slowly into Bischofstein and the only mechanic in the place, a repairer of agricultural implements, was roused and set to work. He made a fine job of the repair, at a cost of 8 marks, but the job took so long that in order to reach Warsaw in time it would have been necessary to average 45 m.p.h. over the snow, an impossible task. Healey therefore decided to retire and this disposed of Great Britain's most formidable car. The corner had another shot at holding back the English invaders, for Miss Riddell got stuck in a deep drift and had great difficulty in extricating the car. She struggled on to Berlin and retired there, and with her went our hope of winning the Coupe des Dames. The Huntley Walkers did not get beyond Warsaw and Lace, who had been delayed by a damaged water pump, plunged into a ditch just over the Polish frontier. By the time he had got the car out he was almost numb with cold and furthermore found that the roads were impassable with freshly fallen snow. Those who maintained their schedule however had a comparatively easy time when they reached Poland, for troops and snowploughs had cleared a one-car passage through all the drifts, which otherwise would have been impassable. The Polish Auto Club excelled itself in looking after the creature comforts of the competitors, and even gave each of them a hamper containing vodka, cigarettes and other things of which more elsewhere. Police were on duty all over Warsaw and to direct the on-coming cars the authorities had even arranged for motor-cycle police to guide the strangers to the exit of the city. There was a good deal of snow between Warsaw and Berlin but nothing worse than had been already encountered. Cold was the most unpleasant feature of the run, and Lacroze and Belgrave, who were driving an M.G. Magna, had to be lifted from their car at Berlin. Nothing upset these two enthusiasts, not even when they ditched their car in Essen through feeling too tired to take another sweep across the street. G.W.J.H. Wright's MG starting from John o'Groats. He finished 64th. 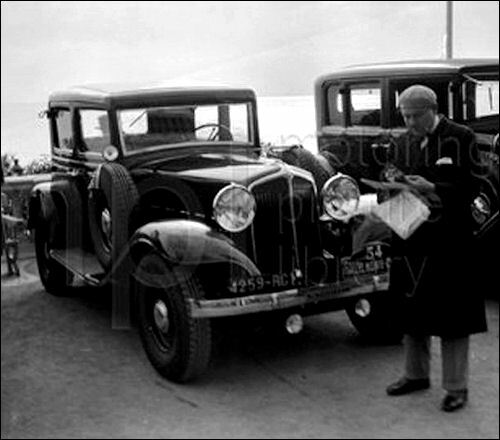 Lord de Clifford and the Gardner Bentley, the only other British car left out of those which started from Tallinn, enjoyed a fairly uneventful journey. In Poland the only fuel they could get was something resembling creosote, and during a short stop for adjusting shock absorbers, the fuel froze up and choked the pipes. After great difficulty and drawing of lamps they were able to purchase paraffin at a village (the inhabitants thought they knew better and insisted on offering petrol). Another unpleasant incident was when the radiators, which were heated from the cooling system, froze up and then burst, allowing nearly all the water to escape. Fortunately this was detected and the main radiator replenished before damage was done. De Clifford himself was not so lucky and was troubled with frost bitten feet most of his stay in Monte Carlo. Apart from these incidents the car ran perfectly throughout the run and averaged 29 m.p.g. in spite of being driven hard all the time. None of the Bucharest competitors reached Poland. Leverett (Riley), was unable to leave Bucharest, and Symons (Sunbeam) who had despaired of starting from the Capital and tried Jassy, fared no better. The snow defeated them too. At Brussels the Tallinn competitors were joined by those from Stavanger and Umea. The famous Tronaaren pass which on other occasions had been so coated with ice that a 40 km. average was quite impossible, was this year less severe, and four cars came through without loss of marks. Whalley (V8 Ford) was the only British competitor, but an Austin 10, driven by Per Bergan was also successful. Mrs. Petre and Miss Richmond driving a 9 h.p. Riley had to leave the road to avoid a "spark" or push chair on runners, and striking a hidden drain pipe damaged the front axle. They struggled to effect repairs but did not continue to the finish. Hutchens (Wolseley Hornet) bent a front dumb-iron in a crash and was late at Oslo. He also had to give up. Selby's crew in the other V8 Ford comprised two men recovering from flu, and one with a bad tooth who could not bear to look over precipices. The front axle was all out of truth as a result of a crash which had occurred before Selby took it over, and altogether it required fairly good determination to reach Monte Carlo, even a day late. made the fastest time at the Mont des Mules Hill Climb. Umea registered 38° of frost when the Rallyites set forth and there was 60 miles of ice between the first two controls and 100 miles of it between the second two. Mrs. Gough was forced into a ditch by a local bus, but got out by laying bushes on the ground. A V8 Ford mistook the railway for the road and turned over about three times, completely writing off the whole outfit, but the passengers were not badly hurt. Dennison and Mrs. Gough on Rileys and Norman Black on a Terraplane got through without loss of marks, but Major Douglas-Morris was not so lucky with his Invicta. Near Paris it started misfiring, and on reaching the high ground near Saulieu, the car refused to climb at all. The owner and his companion, Mr. Fred Salmons, then had to set to work to remove the head, thinking the gasket had gone, but could find no reason for the trouble. Completely exhausted by their exertions in the biting wind they crawled back into the car and went to sleep till morning. The trouble eventually turned out to be nothing worse than a bent valve. Weather conditions in Great Britain made the journey much more severe than of latter years and there was a good deal of ice on the roads from John o'Groats. In the neighbourhood of Aberdeen late arrivals speeding round a corner suddenly came on a whole group of cars stuck on a hill, while their owners were trying to fit chains. Under those circumstances it's a wise man who has thought of fitting four-wheel jacks, but some of the proud owners of these accessories found that they had a nasty habit of turning round the axles if not fitted properly, in which position they were remarkably useless. The Royal Scottish Automobile Club displayed their usual hospitality at Glasgow, and at the Grand Hotel, Harrogate, competitors were able to get a little welcome rest in comfortable surroundings. The London check was at the Royal Automobile Club, and breakfast was available there, though the number of waiters seemed a little inadequate to deal with the hungry band. All the competitors except Wright (M.G. Magnette) reached the coast on time and embarked on board the S.S. Autocarrier which had been specially chartered for the occasion, Wright had the misfortune to lose his passports and other papers, but as they were found soon afterwards and had evidently been ransacked it appeared that someone had mistaken one of the famous R.A.C. black wallets for a note-case. Once in France, the optimists thought, our chains can be put away, but that was where they were mistaken. Round about Rouen the roads were "ver glas" to use a Swedish expression. 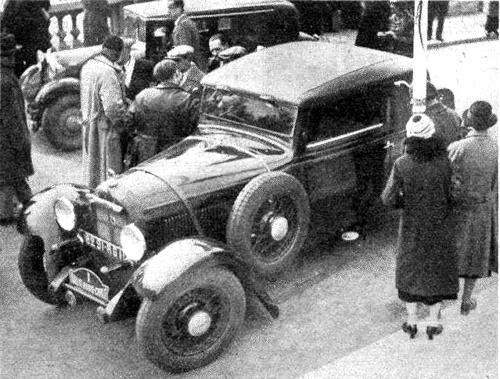 The driver of Jacques' Rolls did not appear to care about the surface and was holding a board meeting about the situation when the S.S. appeared round the corner and had some difficulty in avoiding it, a sudden application of brakes putting the car in the ditch, and a later arrival nearly collected the first two. Aldington, who seemed quite irrepressible here and in Scotland shot past with foot hard down. Miss Labouchere and Miss Coles spent most of their time in ditches reaching Monte Carlo a day late with a bag of four. The Automobile Club de l'Ouest, who, of course, organise the Le Mans race, had prepared a fine welcome for the British competitors many of whom were half frozen and worn out for lack of food. The three ladies in the Hillman Wizard had had a very strenuous time, as the weight of equipment had brought the body down to the exhaust pipe and the underside of the back seat took fire, and Mrs. Martin was overcome by the fumes from the fire extinguisher. They reached Le Mans with 2 minutes to spare. Frank Longman, the well-known motor-cyclist, who was driving the experimental Andre, an unconventional car with a 6 h.p. V twin Jap engine, was in trouble with broken valve springs. Mrs. Montague-Johnson had the same trouble later on and was so exhausted with the work of removing the head and working on the engine that she went to sleep when nearing Bordeaux and her car shot into the ditch and turned over, narrowly missing the stone wall of a barn. Undaunted by this, she got the car out again, minus hood and screen, but quickly fixed up a temporary one in Bordeaux and carried on to Monte Carlo, getting there with 2 minutes to spare, only to be disqualified for having no hood. Hard luck indeed! Stott's Daimler was held up a long time with mysterious overheating trouble, and after Vic Horsman, who was one of the crew, had dismantled the cooling system twice, it was found that in some mysterious way the water pump had frozen up. It would have been a pity if the Daimler had not arrived for in it travelled H. B. Browning, the secretary of the British Competitors Club, lately recovered from appendicitis and already weighed down with calculations of hotel accommodation, dinner arrangements and so forth, which none but he could unravel. His peace of mind was not helped by losing the wallet containing nearly all his money. Toulouse was reached without much further excitement, though the cold had not yet abated. 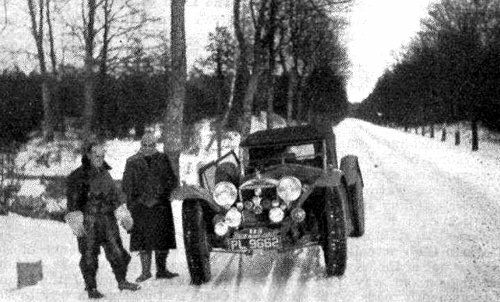 The last lap, in which the northern competitors see their southern rivals for the first time, is often quite exciting, with ice near Aix and on the Estorel, but this year no one except Welch (Lagonda) who got involved in a spectacular mix-up with a laundry van, fell out on this stage. A number of sleepy navigators led their drivers over wrong roads and so forth, but after the usual last minute blinds, the survivors of the Twelfth Monte Carlo Rally entered the town, greeted this year by bright sunshine. A wash and some breakfast prepared the early arrivals for the final tests, and a number of cars were waiting when the final Control opened at 10 a.m. The finish was as on other years on the Quai de Plaisance, alongside the harbour, and here grimed and weary "concurrents" met again in many cases for the first time since leaving England. At the appropriate time each driver handed in his road-book, and took the car to various officials who verified the seals, weighed the ballast and checked dimensions. The car was then ready for the final test, the acceleration test on the Boulevard Albert I, which forms part of the Grand Prix course in April. As no Athens competitor had succeeded in getting through, the winner was certain to come from those who had started from Tallinn, the deciding factor being the marks gained in the final test. It proved to be the genial Vasselle, who in his Hotchkiss saloon thus carried off the Premier Award for the second year in succession. Second in the test was James Wright on the Magnette, who tied for best acceleration with Norman Black (Essex Terraplane) with 8.3 seconds, but who was slightly down on the Hotchkiss by reason of his greater stopping distance. Third was Guyot driving a large Renault saloon, which was not quite as fast as the first two but had superlative brakes, this performance bringing it into second place in the General Classification. Lionel Martin was fifth on the Humber Snipe, aided by good brakes, and altogether British vehicles finished well up in the final test. H. J. Aldington on the Nash with its high bottom gear, did well to record 8.9 seconds but rather misjudged the braking, and Lord De Clifford equalled this figure on the Gardner Bentley, but the brakes of the seven year old car were not up to present day standards. The braking problem of course was complicated by the presence of a second formula for calculating performance which was provided to penalise cars which braked before the line in an endeavour to improve the braking distance. Unfortunately some of the small cars with heavy bodies suffered considerably, since in many cases they had only moderate acceleration but extremely efficient brakes. The S1 formula was on the other hand amply justified in the case of such competitors as Miss Richardson (Ford) who obviously braked several yards before the line. The final test for acceleration and breaking on the boulevard Albert I. The car is a Mercedes-Benz driven by Carl Schade. The Premier Award in the Confort Competition, which is given on the strength of the accommodation, fittings, tool space and the provision of various fittings for helping driver or passengers of Rally cars was won by W. T. Townend with a Talbot "105," which also carried off first prize in the unlimited closed cars class. The car, which was beautifully finished inside and out in the famous Talbot green was particularly noticable for the suitcases, at the back, the tools in a recessed tray at the rear and an unusual car heater which warmed air by passing it over the silencer, thence into the interior of the car, without any danger of fumes. An engine-driven tyre pump and a spare coil wired ready to change over were also noticeable. The French Talbot, which of course would be called a Darracq in this country and which was second in the closed class, made very thorough provisions for the passenger's comfort, the front seat letting down to form a bed. The container at the rear of the car contained every kind of spare and the lower part, which wasused for boots and similar articles, could be reached from the inside. The tools and spare equipment were not required however, as the bonnet of the car was never lifted. Bainbridge's 25 h.p. Rolls Royce, a magnificent car finished in dark blue with dozens of badges in front, had a very special windscreen wiper, which was supplied with water by an electric pump from a container on the dash. The supply lasts 3 hours and the wiper dealt successfully with mud, rain or ice. 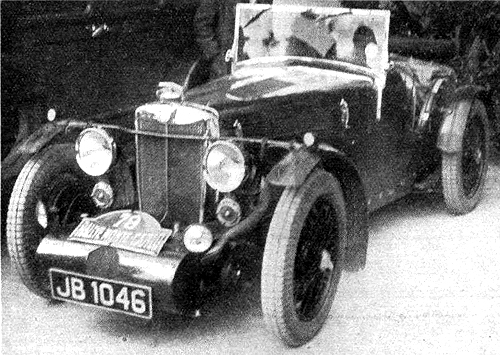 A fine looking 2 litre Lagonda won the large car class for open vehicles, while a special Salmons body with Tickford head which could be completely opened, even to the extent of folding forward the windscreen, was fitted to Major Douglas Morris's, 1,500 c.c. Invicta and caused much favourable comment. No.47 Herbaux and Flipo in Peugeot 201 started from Palermo. BRITISH CARS WIN SIX CLASSES OUT OF SEVEN. THE hill-climb which concludes the motoring week at Monte Carlo, and which is held for the benefit of such competitors in the Rally as may care to take part, is an excellent final test for a touring car. The course is 3 kilometres in length, has a gradient of 1 in 16 and four hairpin bends, thus affording opportunities for blowing up the engine or bending the front axle. The sun shone fitfully and a cold wind chilled competitors waiting to start. First away was W. T. Platt (M.G.) who made a sound climb. The little Balilla Fiat driven by Prince Narishkine sounded fruity, and Lacroze's Magna was well handled, but spluttered a good deal getting away from corners. Berry, who was handling the Frazer Nash in place of Aldington, who had fallen ill at the last minute, made an excellent climb considering that he had not driven up before. He hit the outside bank on the second hairpin but went on without stopping. Wright on the supercharged Magnette seemed perfectly happy, and the brakes were noticeably good. As was expected, he made fastest time of the day. A lucky escape. The two Essex Terraplanes, driven by Norman Black and H.S. The Lagondas went up silently and well, T. C. Mann being the fastest. Crisp's Alvis did not seem too happy, and had a smoky exhaust. 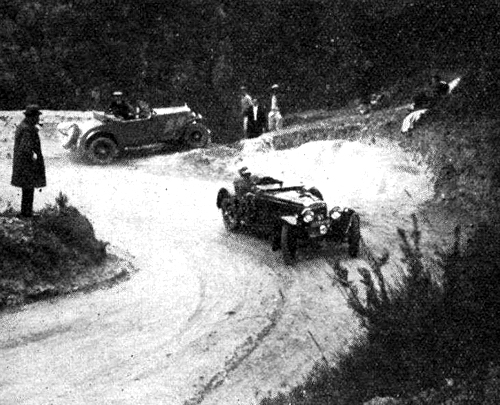 Stael on a 3 litre Bugatti made an effortless climb, while the Lancia was chiefly noticeable for the way it cornered, the good lock allowing it to be taken round the hairpins without needing to keep to the outside. The French and English Talbots driven by Schell and Townend came up without fuss, but the thing which cheered the spectators was the firm way in which the continental drivers cornered on high saloons, taking not the slightest notice of rolling bodies or flexing tyres. The S.S. did not seem very well handled, for though possessing an ample lock it was driven right across the second corner so that the near front wheel struck the bank. Whalley in a V8 Ford made an excellent climb in the 5 litre class, also Ribiero-Ferreira in a Delage. Montpellier (Chrysler) stopped through lack of petrol. Then occurred an incident which might have had unpleasant consequences. P. Despouys, driving a Renault, took the bend leading to the second hairpin too wide and got his outside wheel over the edge with a 200 foot drop below. He somehow managed to wrench his car on to the road again, hit the inner wall and damaged things considerably. The marshal at the corner stopped Linfield who was following, and of all things told him to proceed down the hill again! The marshals were not provided with telephones, so without knowing anything of the stoppage the following driver, Norman Black, also on a Terraplane, came on at full speed. He must have been doing 55 m.p.h. when he appeared round the corner and dashed into Linfield's car. The cars were, of course, very badly damaged, but neither driver was injured, the only people who were being Bert Firman, the conductor of one of the Monte Carlo dance bands and Peatherstonehaugh, who often appears at Brooklands in an Alfa and was playing in the same band as Firman. Luckily almost all the cars had been up the hill, but of the rest de Clifford's Bentley was the only one of interest. He climbed in 3 min. 5.4 secs. and was most spectacular on one of the upper bends, the outside wheels being up on the bank in a most disturbing manner. The British competitors showed up well, raising the class records in the 1,100, 1,500 and 2,000 c.c. classes. depulised for H. J. Aldington. 2, F. Longman (V6), 6 mins. 52.2 secs. 3, F. S. Barnes (Singer), 3 mins. 54 secs. Wright's time was the fastest of the day and is a class record. Previous best, 3 mins. 22.4 secs. 3, Per Bergan (Austin), 4 mins. 20.1 secs. Berry's time is a class record. Previous best, 3 mins. 30 secs. 4, J. V. Crisp (Alvis), 4 mins. 13 secs. Mann heat his previous record by 1.1. sec. 2, Prince von Sehoenburg-Waldenburg (Lancia), 3 mins. 31 secs. 3, J. van Abbe (Rockne), 3 mins. 36 secs. 1, Lord de Clifford (Gardner-Diesel-Bentley), 3 mins. 50.4 secs., 46,793 k.p.h. 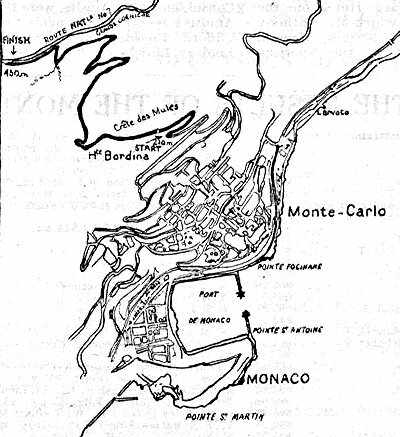 The Automobile Club de Monaco Cup for fastest time of the day was won by G. W. J. H. Wright (M.G. Magnette).